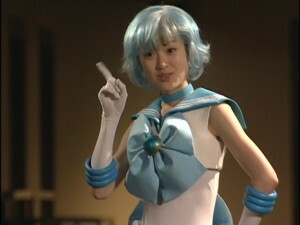 Rika Izumi, who played Sailor Mercury in the live action Pretty Guardian Sailor Moon series, can be seen on the official Sailor Moon site although no mention of her involvement in the franchise accompanies it! Rika Izumi, who went by the name Hama Chisaki when she played Ami Mizuno, appears on the cover of the latest issue of Tokyo Calendar. The fact that the magazine’s cover model used to be on a Sailor Moon series actually has nothing to do with the magazine’s inclusion on the site. 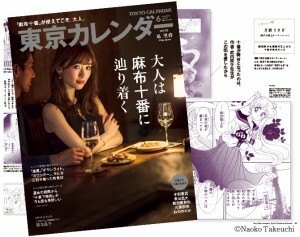 It is featured because of a story in its pages which discusses Sailor Moon taking place in the Azuba Juban area of Tokyo. Though the site only mentions that the article will be appearing in the next issue of the magazine the Tokyo Calendar site actually includes an online version of the article. Check it out to see an interview, in Japanese, with Sailor Moon’s editor Fumio Osano, Osabu, about Sailor Moon taking place in Azuba Juban. You can also check out this article on dining in Azuba Juban which features Rika Izumi who is in this piece a normal Japanese adult and not dressed as a superhero or genius school girl. I sometimes feel like the fantastic live action series is being completely forgotten by those who control the Sailor Moon property! It often receives little or no mention when various versions of the series are considered and this latest article is a fine example of that! Rather than acknowledge that this actress who had a major role in the only Sailor Moon series to be on TV during that entire decade the live action series remains firmly swept under the carpet like it was the Star Wars Holiday Special! Meanwhile the cast of the series got together recently to celebrate Daigo’s 40th birthday. Daigo is Keiko Kitagawa’s husband. They regularly get together to celebrate each other’s birthdays or similar such events. I’m glad someone remembers this series favourably! 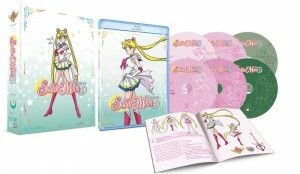 Sailor Moon SuperS Part 1 will be out on DVD and Blu-Ray on April 24th. Those looking to pre-order it should be careful to get the right version. I often get these from Amazon however the Special Edition is hard to find on the site. The Amazon listing for the product only includes the DVD and Regular Edition Blu-Ray but there is a separate page with no box art which has the Special Edition Blu-Ray. This includes a box to house both volumes and a special booklet. The set can also be pre-ordered from Right Stuf. They have Special Edition Blu-Ray, Standard Edition Blu-Ray and DVD copies listed on their site. We also recently got cast information about Sailor Moon SuperS Part 2! 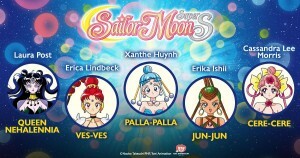 Long ago we learned about the actors appearing in Part 1 but it wasn’t until a couple of weeks ago at Anime Boston that we finally got an announcement of who would be voicing Queen Nehelenia (now spelled Nehalennia) and the Amazoness Quartet. This was confirmed on Twitter. The Amazon Quartet take the place of the Amazon Trio as the season’s villains once their story arc is completed. The cast includes Laura Post as Queen Nehalennia, Erica Lindbeck as Ves-Ves, Xanthe Huynh as Palla-Palla, Erika Ishii as Jun-Jun and Cassandra Lee Morris as Cere-Cere. Cassandra Lee Morris previously voiced Calaveras of the Ayakashi Sisters in Sailor Moon R.
Are you planning on picking up this set? 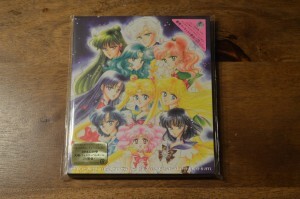 The Pretty Guardian Sailor Moon The 25th Anniversary Memorial Tribute Album CD was released in Japan on April 4th. I picked up my copy from Amazon Japan which meant that I got the Amazon Japan exclusive sticker featuring Usagi and Chibiusa. Having had a chance to listen to the album a couple of times I thought I would share my thoughts on it. Overall it’s enjoyable to hear these iconic tracks with a bit of a twist. All considered I much preferred the 20th Anniversary Memorial Tribute album released about 5 years ago as it had a bit more variety and a lot of the songs on this album are just a rehash of those. Some of the tracks are pretty good but I wouldn’t say any of them are superior to their originals for all that’s worth. Moonlight Densetsu performed by LiSA is decent. We’ve seen this song redone so many times though and this is hardly the best we’ve seen! It’s a more upbeat version and a more significant departure from the original than the other one we have on this album. La Soldier by Gesshoku Kaigi is one of the better tracks. 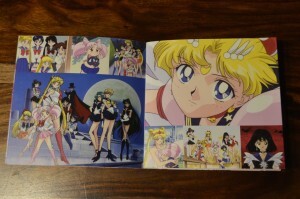 La Soldier, although featured in the final real episode of Sailor Moon R, is a musical song. It’s actually the only musical song on this album and was also the only musical song on the last Tribute Album. It’s a great song and it certainly would have been nice to see more covers of musical songs. Moon Revenge by BiSH is terrible! I’m all for switching things up but this one is a bit too much! It’s starts out fast and gets faster until it’s pretty much a joke at which point there’s a bunch of screaming. What a farce! We got a cover of Moon Revenge, which is from Sailor Moon R The Movie, by Momoiro Clover Z a few years ago. It would have been nice to get a cover of another movie song instead or in addition to this. Otome No Policy is Otome No pointless. What a waste of time! Yoko Ishida returns to do a “cover” of this ending theme from Sailor Moon R. It’s pretty much the same as the version she recorded 25 years ago. Further she performed it just recently at the Classic Concert. What is the point of this? It’s a tribute album! You don’t just get the same artist to do the same song in the same style. What is this, Evangelion 1.0 You Are (Not) Alone? Kakumei wa Night & Day or Revolution is Night & Day by Etsuko Yakushimaru is finally something a bit new. Here’s a song we didn’t see on the last Tribute Album for a change! This is from Sailor Moon Crystal, sort of it. It’s a character song which originally featured the entire cast. While it’s certainly nice to hear something a bit different this really isn’t a song I had much affection for. 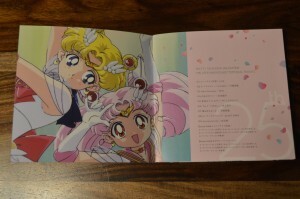 The Sailor Moon Character Song CD was released in April 2015 but didn’t actually include any music from the series but instead songs performed by the cast. Character songs are common for Sailor Moon series. The original anime and live action series had many such songs released on CDs and singles, some of which actually appeared on the shows. This makes me wonder why this was chosen for inclusion instead of some perhaps more memorable character songs from the past? I would have enjoyed a duet of You’re Just My Love covered by a pair of popular artists. Regardless I do appreciate the attempt at something different on this album that is so much a rehash of songs we hear time and time again … and again. “Rashiku” Ikimashou or I’ll Go As Myself, performed by Sonoko Inoue, is a fairly enjoyable track. This ending theme for Sailor Moon SuperS which was also included at the end of the Ami’s First Love special is a fun pop upbeat pop song which lends itself well to being covered by a new artist! This version is a bit different which is always good. Isn’t that the point? Kaze mo Sora mo Kitto or The Wind, the Sky, Surely, is the second track performed by Gesshoku Kaigi. This was originally the ending theme for Sailor Stars. This is a decent track which departs a bit from the original but doesn’t surpass it in quality. The Sailor Stars Song is performed by Silent Siren. This is a great opening theme so it’s kind of hard to do a bad job of it. Silent Siren’s cover is enjoyable. Eternal Eternity is performed by Ziyou-Vachi. This is the first ending theme for the third season of Sailor Moon Crystal which originally featured Sailor Uranus and Neptune and was performed by their voice actors. Upon hearing this song I immediately recognized Avu-chan, who provides the Sailor Uranus part of the vocals on this song. Avu-chan was half of the duet which performed Ai No Senshi on the first Tribute Album. Since her performance was not as a member of Ziyou-Vachi on that album I did not originally spot that this was yet another artist who was returning for this album. Having a transgender woman to provide the voice of Sailor Uranus is a bit odd to me. Haruka is a woman with masculine tendencies. To have her voice performed by a transgender woman who herself identifies with femininity seems potentially insensitive. That said I don’t know much about this particular artist. Perhaps this is a character that she somehow identifies with so without specifics I can’t really pass judgement. Finally we have two bonus tracks which are both performed by voice actors from Sailor Moon Crystal. 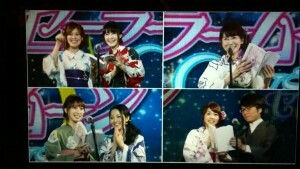 This being the voices of Sailor Moon, Mercury, Mars, Jupiter and Venus. They perform Moonlight Densetsu or Moonlight Legend, the Sailor Moon anime opening theme, and Tuxedo Mirage, the Sailor Moon S ending theme. While this is an interesting choice for performers the songs are pretty much like the ones we’ve already heard. Tuxedo Mirage in particular is almost indistinguishable from the original. Not too impressive but as so called bonus tracks I feel like it’s better than nothing. Ultimately a limiting factor in my enjoyment of this album may simply be that I’m unfamiliar with many of these artists. If I were a Japanese music fan living in Japan and familiar with some or all of these bands I might be excited to hear them perform some of these songs which I enjoy so much but I really come at this only as a Sailor Moon fan who has no real investment in these artists. Still there were tracks on the first Tribute Album that really blew me away. When I heard Tommy heavenly6’s La Soldier I was so impressed with it that I sought out and listened to a number of her albums. This album didn’t encourage me to do anything similar with any of the artists involved. As packaging goes this one is nothing too extraordinary. 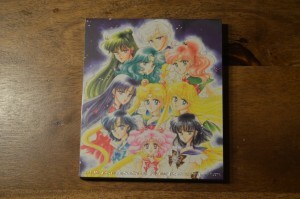 The cover is a bit disappointing as it’s just recycled art from the recently released Sailor Moon 20th Anniversary Book. 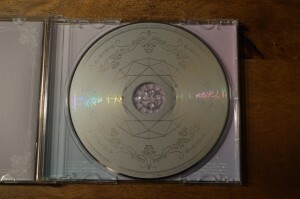 The CD is pretty neat with a sort of rotational symmetry which may frustrate you if you’re trying to orient it correctly. I decided to try to line mine up straight with the hard to make out Compact Disc logo. The included booklet which includes 20 pages is quite nice. With so many CDs these days having little to no insert it’s nice to see a few pages of art and full lyrics for all songs as we see here. I’ve included photos of all pages of this booklet at the end of the post. I also got a special sticker for having pre-ordered this from Amazon Japan. There are a number of different stickers which are included depending on where you got the album. 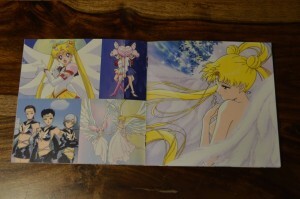 These were all cover art from the Sailor Moon manga. 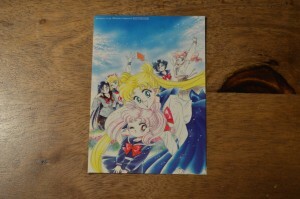 The sticker I got featured Usagi and Chibiusa with the other Sailor Guardians in the background. Do I recommend this? My feelings on it are pretty lukewarm. If it wasn’t evident I much preferred the 20th Anniversary Tribute album. Still there are a few enjoyable tracks that a fan might appreciate. It may not be worth the effort to import but should it become available to download from a digital service like iTunes down the line that would be a justifiable purchase. There is also, of course, the option of acquiring it less than legally. I will always encourage supporting the show though there are certainly no shortage of options for doing so with the way Sailor Moon is monetized these days. I won’t facilitate sharing such things on this site but ultimately I leave that kind of decision to you! Keep reading for more images of the box art and all pages of the included booklet. The Sailor Moon The 25th Anniversary Tribute Album will be released later this week, on April 4th, but you can now see a video previewing of all tracks on the Sailor Moon official site. I had previously posted a translation of all tracks on this album. We have now also learned of two bonus tracks which will be included. These are Moonlight Densetsu (Moonlight Legend), the original Sailor Moon anime opening theme, as well as Tuxedo Mirage, the ending theme to Sailor Moon S. Both of these tracks will be performed by the cast of Sailor Moon Crystal. That being Kotono Mitsuishi, Sailor Moon, Hisako Kanemoto, Sailor Mercury, Rina Sato, Sailor Mars, Ami Koshimizu, Sailor Jupiter, and Shizuka Ito, Sailor Venus. It sure is nice to see that they still have the contact information of the Sailor Moon Crystal cast, what with it having been so long since they’ve recorded any episodes of the show. What do you think? I’ve got a few thoughts already! I don’t like Moon Revenge at all. I’m all for doing a cover in a different style but this fast pace just doesn’t fit the song to me. I’m pretty disappointed with Otome No Policy being so similar to the original version. Why get the original artist back to sing the same song in the exact same way especially after we just got a fairly similar version from the Classic Concert? Hearing Moonlight Densetsu with the new cast is pretty neat, though this song is generally done to death. We had originally gotten a “Pretty Cast” version of this song from the original anime. 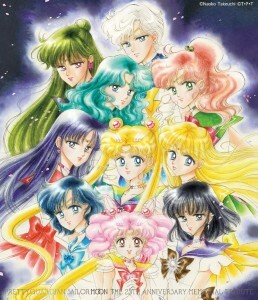 Pretty Cast was a name for a group composed of the five voice actors voicing the original Sailor Guardians. As they were also the original voices for Moon Revenge I would have preferred to see them do the vocals for this song as a bonus and perhaps give something more fitting to BiSH. Any favourite tracks out of these? Are you picking up this album this week?